On a business trip, nothing looks more unprofessional than lugging around a giant case. The goal is to be light and nimble, but also equipped to look your best throughout, whatever the occasion. Having a wardrobe of fine custom-made suits, shirts, and blazers, and selecting the right ones to accompany you on your trip, is how you dress to impress. 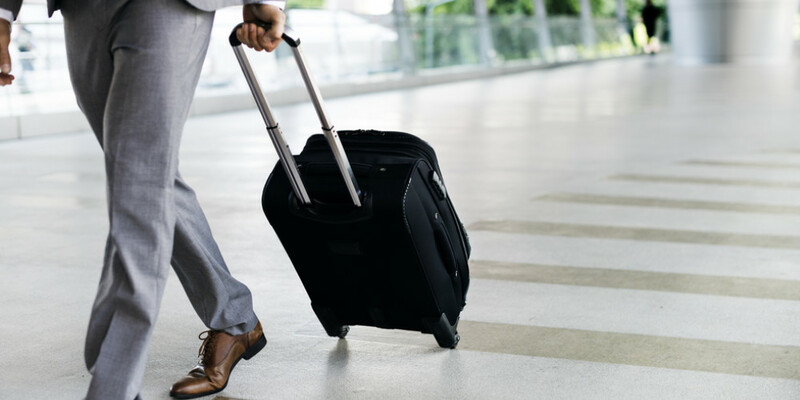 Though we all like to travel light on those rapid turnaround business trips, being caught short without the clothing you need can be a nightmare. The key to how to dress for success on a business trip is to find a balance. Unless you’re going on a longer trip and checking bags, you do not want to take your entire wardrobe of suits, chinos, smart casuals, and leisure wear. This is business so you want to err on the side of dressing up. Remember that a great bespoke suit can work for the boardroom during the day and also at a more casual evening party if you go tie-less with a sharp solid or white shirt. When’s the last time you heard of someone being criticized for looking too good? Make sure you have quality luggage. No detail about you should look cheap, including your luggage, clothing, and accessories. Pack carefully, using a garment bag or separate compartment for your suit or jacket that you don’t wear when traveling. If you need to fold it, hang your suit on a hanger and enclose it in a suit cover, then fold it over in a natural way so it fits in your bag. When you get to your hotel, hang your suit up or drape it on a chair first to air it out a little. Hotels, especially business hotels, may be able to give you a steamer or trouser press even if these are no longer standard items. Just don’t try using something you aren’t familiar with right before a meeting. It’s better to have a slightly sub-par crease in your trousers than ruin the only suit you have with you. If you are staying for a longer time, you can use the hotel’s laundry service to have underwear and shirts sent out for cleaning halfway through. If you have some free time, you can even wander to the local dry cleaners yourself to ensure your suit is being treated the way it deserves. To get the right custom men’s outfits that will help make your Miami business trips a success, contact Pepi Bertini to get measured for your new bespoke men’s clothing.